S.D. Hambaugh, a tourist court operator from Tucson, and C.G. Wallace, a trader with the Zuni Indians, built the De Anza Motor Lodge in 1939, along the Central Avenue alignment of Route 66 through Albuquerque. The motel is an important example of a pre World War II tourist court expanded after the war to take advantage of automobile traffic along Route 66 and for its association with Wallace, a well-known trader with the Zuni Indians who soon became the sole proprietor. The motel offered comfortable lodging and Zuni merchandise and served as a gathering place for traders and craftsmen, and tourists who appreciated and collected Southwestern Indian crafts and jewelry. Charles Garrett Wallace came to New Mexico in 1919 and began working for the Ilfeld Company, a mercantile enterprise with stores in railroad towns and on Indian reservations. The company sent Wallace to work at the company’s trading post at Zuni. In 1920, Wallace acquired his trading license with the Zuni Pueblo and set out to learn as much as he could by visiting residents and studying their language. The Zuni called him Lhamsta, or Tall Thin Man, and sometimes Mujugi, or Night Owl, because of his practice of writing letters well into the night advertising his trading business. By either name, Wallace soon emerged as a central figure in Zuni trading. Between 1920 and 1950, he introduced new jewelry equipment, provided materials, was the innovator of new designs and techniques, and promoted traditional motifs, all of which contributed to a rise in jewelry-related tribal income from four to 65 percent. As soon as the Fred Harvey Company began offering hugely popular Indian Detours in the mid 1920s, Wallace saw Route 66 as a potential market for Zuni goods. During this period, especially with the onset of the Great Depression, the barter system that characterized the earlier trading post economy began to fail. Tourism along the highway emerged as a means of infusing the pueblos with outside cash. Wallace also saw the road’s commercial potential and invested in six ventures along the storied corridor. With his tireless promotion of Zuni crafts, Wallace functioned as an indispensable conduit between the Zuni people and tourists. The De Anza Motor Lodge offered convenience, comfort, and atmosphere and was the largest motel project to date at the time of its construction along East Central Avenue. Described as an ultra-modern tourist court, the De Anza provided showers and steam heat, private telephones, and an air-cooling system in every unit. The complex initially reflected Spanish and Pueblo architectural styles in its exposed vigas, wide overhangs, and battered walls. A jewelry counter was easily accessible in the lobby, and a small silver shop occupied part of the maintenance room. Within two years of its opening, traffic along Central Avenue increased by 25 percent. The De Anza Motor Lodge was well prepared to meet the influx. Wallace updated the lodge when he saw opportunities to add revenue and functions. As Route 66 tourism grew after World War II, Wallace expanded the number of rooms from the original 30, to 55, to 67. He also added a café called the Turquoise Room to the building’s southwestern corner, and a new carport with sandstone supports provided shelter for people leaving their cars at the office. Two buildings went up on the rear of the lot, and one was expanded via a second story. Below this two story component, Wallace arranged for the excavation of a basement. In the basement conference room, Zuni artist Tony Edaakie painted a series of murals depicting the winter Shalako procession, a culminating event in the Zuni year. His quest for improving motel service and appearance also prompted Wallace to become involved with the US 66 Highway Association. When it began in the 1940s, the association embraced motels from Missouri to California, including Wallace's De Anza. As the association expanded to include other highways, it renamed itself Western Motels, Inc., and eventually became known as Best Western. During the late 1950s, when larger franchises eclipsed many pre-World War II motels along Route 66, the improvements Wallace made enabled the De Anza to remain competitive. 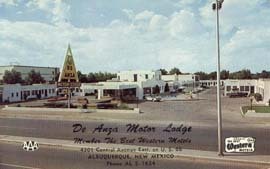 The motel remained listed as an American Automobile Association-approved accommodation until the early 1990s. Wallace died in 1993. Today, the neon, triangular, 35-foot-high “De Anza Motor Lodge” sign in front and the distinctly square-with-rounded-corners, pueblo-like shape of the buildings define the only survivor of Wallace’s Route 66 endeavors. Although in disrepair, the De Anza remains a fine example of a Route 66 motel. American Movie Classics filmed recent episodes of its series “Breaking Bad” in the parking lot there. Recognizing the significance of the property, the City of Albuquerque acquired the motel with the intent of seeking a new owner who will develop and reuse the property in a way respectful of its history. The National Park Service listed it in the National Register of Historic Places in 2004. 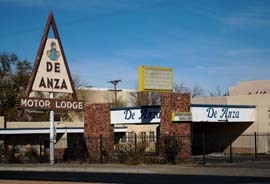 The De Anza Motor Lodge is located at 4301 Central Ave. Northeast in Albuquerque, NM. The lodge is not operating and is accessible only for viewing from the public right of way.